Sales: On-farm, and at Blue Goose and Larry’s Produce. Sales: On-farm and farmers’ markets. Hours: June – September, 9 am to 6 pm, 7 days a week, September – May please call for hours. Products: Within our family orchard, Twin Peaks Orchards, we now have a certified organic farm. 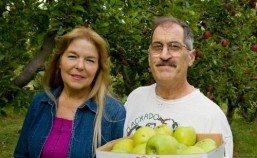 Owned and operated by the fourth generation of the Twin Peaks family, Orchard Delights was certified organic by CCOF in 2011. 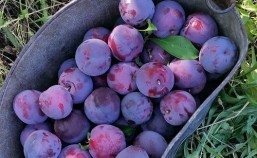 We offer tree ripe Peaches, Nectarines, Plums, Prunes, Cherries, Apricots, Blackberries, Pomegranates, Persimmons, Navel Oranges and Pink Grapefruit. Hours: June – September 9 am to 6 pm; 7 days a week, September – May, please call for hours. Products:Twin Peaks Orchards has been family owned and operated since 1912. We grow premium, tree ripe Peaches, Nectarines, Cherries, Apricots, Plums, Pluots, Blackberries, Guavas, Pomegranates, Jujubes, Avocados, Lemons, Mandarins, Navel Oranges, Blood Oranges, Pomellos, Grapefuits and Persimmons including the Amagaki Persimmon: a Twin Peaks Orchards exclusive. On site we craft jams, syrups, jellies, honey and canned fruit in our Certified Food Processing Facility. Also part of the Twin Peaks Orchards family is a Certified Organic farm: Orchard Delights at Twin Peaks. 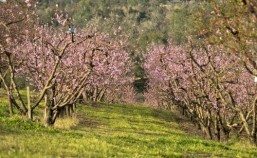 Certified by CCOF in 2011, Orchard Delights offers Peaches, Plums, Nectarines, Cherries, Prunes, Persimmons, Grapefuit, Oranges, Pomegranates and Blackberries.